Pandemic Flu, Flooding, Severe Weather, and loss of Energy sources are among the major risks to the community. In his talk, Andrew will describe the various organisations that are involved nationally and locally in dealing with these risks. 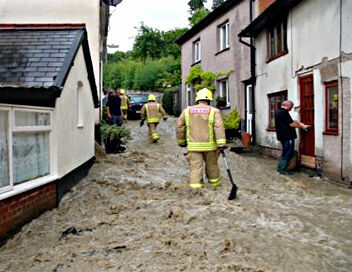 In particular he will cover the Dyfed Powys Local Resilience Forum, which has the responsibilty to plan for, respond to, and recover from emergencies in our area. The Community Risk Register for the Dyfed Powys area assesses the most significant risks to the community, and Andrew will go through those that are most relevant in the Llandrindod area. As well as describing how the Emergency Planning services prepare to deal with these issues, he will look at how individuals and households can best prepare themselves to mitigate the impact of major events. Admission to the meeting is free. A donation will be requested to contribute to the costs of refreshments. A poster to help promote this meeting is available to download. A Green Open Homes event is an opportunity to visit homes of people who have made energy saving improvements and see if the same thing might work for you. It's a great way to find out about the reality of getting solar panels, insulation, triple glazing, or new heating options without talking to a salesman. You can have a good look at the technology, ask the residents whether the installation was a hassle, and find out much they’re really saving on their energy bills as a result. This year's event has been organised by Lightfoot Energy Service with support from the Llandrindod Transition group. So far, eight homes have agreed to take part where you can go and see a huge range of energy efficiency measures and talk to the owners about their experiences and reasons for choosing particular solutions. 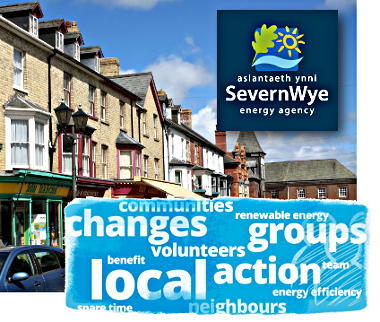 The information hub for the day is at the Herb Garden Cafe, where expert advice wil be available from a number of suppliers and independant advisors including Severn Wye Energy Agency (SWEA) and specialist renewables installer M Bufton Ltd. Assembly Member Kirsty Williams will also be dropping by during the day. We recommend you start your day at the Cafe, where you can talk to the experts and make arrangements to visit the properties that will be most relevant to your interests. Update - a copy of the slides from Alan's presentation is available to download. Are you interested in doing something practical to reduce our town's Carbon Footprint? Come along and share your ideas and contribute to the discussion. A poster to help promoted this meeting is available to download. Update: Permaculture and Forest Garden Information sheets are now available. Fifteen years ago Martin Crawford moved from conventional organic gardening to creating a forest garden from a bare field. Today Martin Crawford's garden is a fantastic example of what can be achieved with a minimum effort input to produce abundant crops of edible trees, plants, shrubs and ground cover. In this film he takes us through the seasons of his garden and shows the huge range of plants that can be grown. The film will be introduced by Roz Brown who will also be talking after the film about the close links between Permaculture and Transition. We've watched this film over again when we want something gentle and inspiring ... and every time we've come away having focused on something that escaped us before. A poster to help promote this event is available. Please download and display.